As the IT world shifts to the cloud, virtually all of the categories within IT are making the leap. While applications and infrastructure have been leading the way, IT management tools are starting to catch up. One of the last categories to make the leap to the cloud has been identity management, especially on Linux systems. The delay in this functionality natively in AD has many IT admins have wondering if there is an alternative solution that could work. Essentially, they’re looking for an Active Directory® as-a-Service that can support Linux authentication. Considering that the IT landscape has shifted from a platform perspective, the ability to authenticate non-Windows platforms has become a critical need. The IT network and data center operating system used to be dominated by Microsoft Windows. More recently though, both of these areas have shifted. Internal platform choices have changed dramatically away from Windows, with only one in five devices now being Windows based. A similar trend has taken hold in the data center space with the most dominant platform being Linux. This shift in the data center platform has been largely enabled by the fact that most organizations are no longer building their own data centers, but rather leveraging Infrastructure-as-a-Service providers like AWS, Azure, and Google Cloud Platform. These IaaS providers, and many others, have helped shift the balance towards Linux. Because of this fundamental shift in the platform space, IT admins are looking for ways to seamlessly integrate user access into their identity management platform. For many of these organizations, Microsoft Active Directory has historically been the identity management platform of choice. But as the world shifts to the cloud and towards Linux, IT organizations are searching for alternatives. 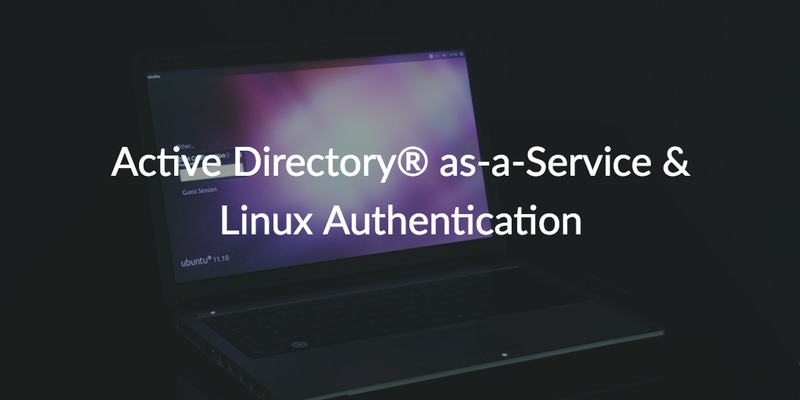 The concept of an Active Directory as-a-Service solution that supports Linux authentication is appealing. An Active Directory as-a-Service Solution? IT admins know that Active Directory struggles with macOS and Linux, and virtually any non-Windows platform for that matter. These struggles have plagued IT, and many have thought about a new generation of AD as a service that could solve this problem. While there is no product named AD as-a-Service, the concept of a cloud directory service does exist. Microsoft would have you believe that Azure Active Directory is this solution, but unfortunately it isn’t a cloud replacement for Active Directory, but rather a complementary solution to AD. A new SaaS directory service is emerging, and it is taking on the mantle of an Active Directory as-a-service like solution. Called Directory-as-a-Service®, this third party cloud identity management platform isn’t tied to any particular platform, protocol, provider, or location. It functions as a cloud directory service and treats Linux and macOS machines as first class citizens, just like Windows. Providers such as AWS, G Suite, Google Cloud Platform, and many others are on equal footing as Office 365 and Microsoft solutions as well. Active Directory as-a-Service does not technically exist – and conventional, on-prem AD does not support Linux authentication. However, a new generation of cloud directory services does. The cloud-based directory can support your Linux infrastructure hosted on-prem, at AWS, at Google Cloud Platform, and many others. Check it out for yourself by signing up for a free account. Your first 10 users are free forever, so there’s no reason not to give it a shot. Alternatively, reach out to us if you would like to learn more. We would be more than happy to show you how the platform can authenticate access to Linux platforms and more.